Save on a Stressless Sunrise Large Recliner with Ottoman at Unwind! Looking for Super Stressless deals? Our Ekornes Authorized Price Reduction Sale is Going on Now! Now make your preferred leather or fabric type selection by using the pull down menu above, which is titled: "Select Leather or Fabric Type and Color". It is an excellent time of year to purchase from the well-padded, soft, comfortable Stressless Sunrise lineup! This super-comfortable series guarantees unsurpassed head, neck and back support and the perfectly soft cushioning allows you to sit in comfort for many hours on end. The Sunrise is a popular model because of its padding. It provides "just enough" without straying into "too much". The fluffy headrest allows to relax and let your head recline and you lean back and forget about the stress of every day life. Your arms will feel soothed as they lightly sink into the padding on the armrests. The Comfort Zone™ lines allow those with broad shoulders to fit perfectly. Your body will feel gently cradled as it allowes your blood flow to optimize and your muscles to let go. These truly are "Stress Free" chairs. Take advantage of our large stocking program and have your large Sunrise delivered Fully-Assembled to anywhere in the nation. The Shimmering Stressless Large Sunrise Recliner with Ottoman. Learn about Inside or White Glove Delivery at Unwind.com. With smooth, light padding, round corners and a warm stature, the focus is clearly on simplicity. The back-saving Sunrise Recliner (large size) shines brightly in a world clouded by the lazy-era, bad-for-your-back recliners of yesteryear. The Stressless Sunrise Recliner will support your head, neck, lumbar and legs like no other recliner. In fact, you'll likely find it easily surpasses your comfort and support goals with a bright, glowing style. Take the "Comfort Test"™ today! It's elementary really... This "test" is a list of probing questions to guide you in determing which recliner and size is the "perfect fit". Maybe you would prefer one of the exquisite fabric upholsteries offered by Ekornes over the leather options. If this is the case, the options are nearly limitless. There are 12 different fabric grades and nearly 99 different colors. Your fabric options include: Stella, Ocean, Luna, Verona, Siena, and Dinamica. The Dinamica is the most exclusive and costs a little bit more than the other fabrics. It is usually equal in price to Batick Leather. 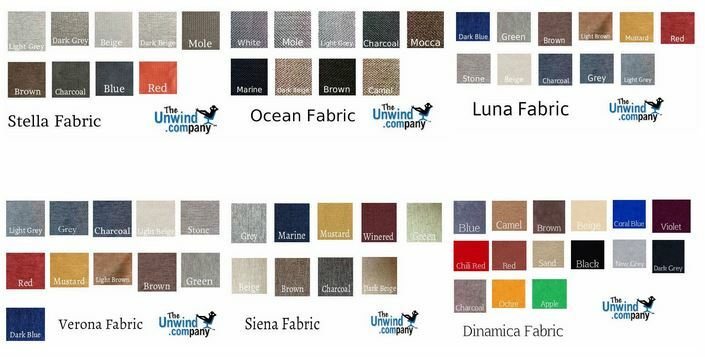 Check out our color palettes below to see some of the available colors in each fabric. Check out the cleaning products for your furniture that Ekornes exclusively sells and endorses: Fabric Cleaning Kit or Leather Cleaning Kit. Also, it's important to note that fabrics are available at a lower price than the Leather options for Stressless and Ekornes Furniture. The only exclusion is: The Dinamica Option. 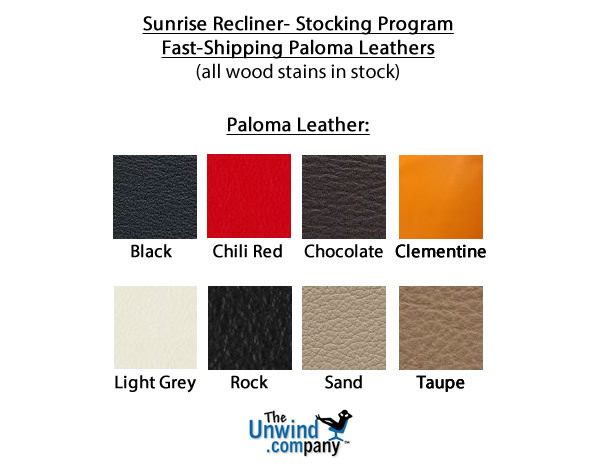 It is equal in pricing to the Batick Leather on most models but still more affordable than Paloma, Classic & Royalin leather choices. 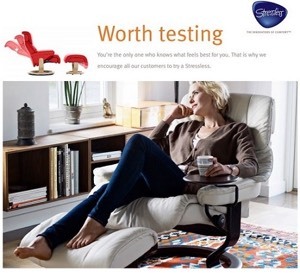 Want to see tons of Ekornes Stressless Sunrise chair videos? Visit our Stressless Sunrise video channel on YouTube. Like its smaller siblings (the shining Stressless Sunrise-Small and the Stressless Sunrise-Medium, the Stressless Large Sunrise Recliner is smooth with gentle, rounded edges which make it very supportive and comfortable. We find this model to be pretty well suited for those that don't like the typical recliners that are "over-cushioned" to the extent that back and neck support is compromised. With the Stressless Sunrise recliner, you can easily feel the generous support that's cradling your body in all the appropriate places. 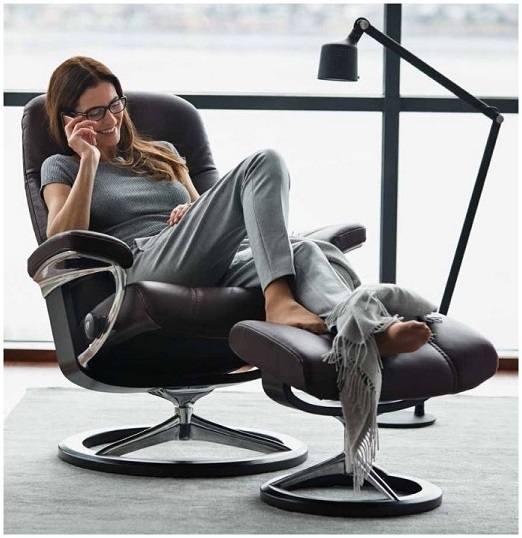 The Ekornes Sunrise large recliner offers the Patented Plus System for constant comfort and is so stylish and elegant that it will feel "at home" in almost any living room, game room, bedroom, or even at the office. Yet it still manages to deliver the same back and neck-saving features that Ekornes Stressless Recliners, chairs and furniture are famous for throughout the world! The large Stressless Sunrise offers great comfort and support- especially to individuals who fit the "medium-large" to "large" frame size characteristics (warranty is valid for weights up to 350 pounds). We have many Sunrise recliners in stock in multiple locations which allows us the ability to ship your recliner extremely fast and have it delivered quickly from coast to coast. Typically, we can deliver your recliner nationwide faster than any other company. Please call 1-888-486-9463 and you can be enjoying your Stressless recliner much faster than you ever imagined. So, we expect that since the "company car" might be losing some ground as far as perks go, we'd like to recommend a perk that will continue to deliver for years to come- a Stressless Sunrise recliner (maybe the smaller size please- as we get a bit older, the extra support will come in handy). Could someone please call our manager and mention this idea? We're thankful to get to borrow the company car, but gas prices can really be stressful these days. - The easily-moved ottoman also features the built-in Glide System that adjusts to your body movements for the ultimate in comfort. Need to use the ottoman as a separate seat on occasion? No problem, simply lock the 4 yellow clips located underneath the ottoman. Now it will not pivot and can be used as a seat or stool. -Stressless Recliners are created for a custom fit- Many of the Stressless recliners come in three sizes (small, medium or large) and many sofas are available in two sizes (medium or large). The Sunrise Recliner-large is comparable in size to the large versions of the other Stressless recliner lines (Stressless Kensington, Stressless Vegas, Stressless Ambassador, etc). The Stressless Sunrise (Small), the Stressless Sunrise (Medium) and the large Stressless Sunrise recliners share the same attributes. For best results, take a seat (or drop us a call or email) and let us help you determine which size will ultimately offer the most comfort and correct support for your individual body size and weight. We really want you to benefit from your Stressless Recliner for many years to come! It is no surprise that Stressless Sunrise Recliners are Exclusively Endorsed by the American Chiropractic Association (the ACA). 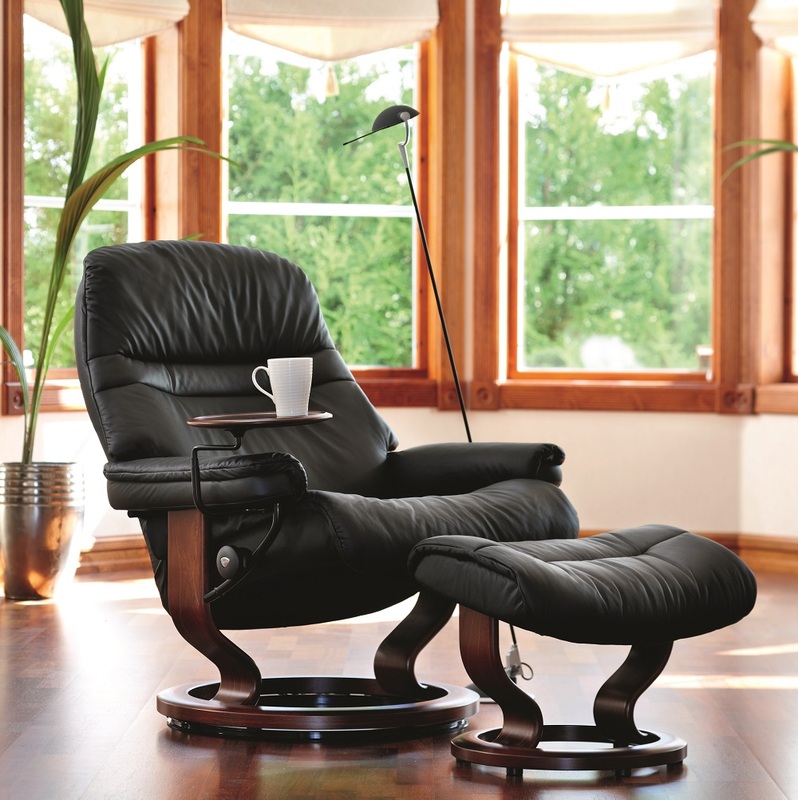 Come visit the Unwind Back & Body Store to experience the large Ekornes Sunrise Recliner for yourself. If you have already decided and are ready to purchase, simply click the "Add To Cart" button after selecting from the available options. We will ship your recliner fully-assembled and fast. Please review our return policy prior to ordering or call 888-486-9463 for personal assistance. You may also email stressless@unwind.com anytime- 24 hours a day, 7 days a week. This is a great recliner. I've wanted an Ekornes chair for years and finally made the purchase. I couldn't be happier.